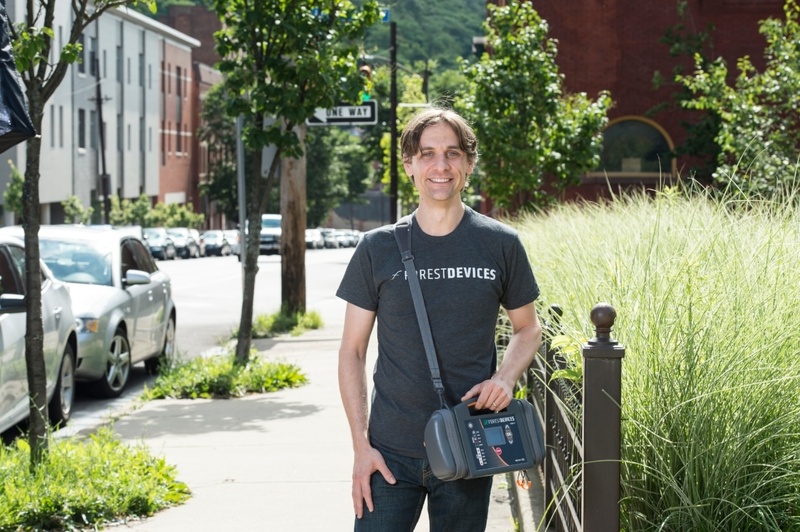 Matt Kesinger stands outside the offices of Forest Devices along Fifth Avenue in Pittsburgh’s Uptown neighborhood with the company’s prototype stroke diagnosis device strapped to his shoulder. Matt Kesinger says he will finish Pitt medical school … someday. The native Texan already has a little over three years under his belt, so he is close to achieving that goal. And while he admits that having the M.D. appellation on his name will make mom proud, he recognizes that after all of that effort, he may never treat a patient. For Kesinger, studying medicine has evolved into an adventure in entrepreneurship, where he hopes to make an even bigger impact by bringing to life a product that diagnoses strokes quickly and accurately. Kesinger interrupted his medical school studies two years ago to launch a startup company around his vision, which builds on his passion for emergency medicine that first kindled his interest in becoming a doctor. Kesinger believes his company, Forest Devices, can help improve the quality of life for people who suffer strokes by providing faster diagnosis that allows medical professionals to direct them to the correct level of care, which also reduces costs for hospital systems. So far, 2017 has witnessed a rapid progression of major milestones for Kesinger and Forest Devices. In April, the company took home $600,000 in prize money in the national RICE Business Plan Competition in his native Texas, right around the same time Kesinger became a first-time father. In May, Kesinger completed his master’s degree in health policy in order to become versed in the nation’s rapidly evolving healthcare system and help him grasp the complexities of medical reimbursement. Forest Devices is currently preparing for the second study for its device that could lead to an application to the FDA next year. Kesinger said the initial study last year conducted in partnership with UPMC and West Virginia University demonstrated a high level of accuracy for patients already admitted to the hospital. Operating now with eight employees at a co-working space in Pittsburgh’s Uptown neighborhood, Kesinger and his company are at a tipping point that he couldn’t have envisioned five years ago, when he lacked a shred of scientific or business experience or training. Kesinger has applied a “learn as you go” philosophy to his life, coupling hands-on experiential learning opportunities to the work he is involved in. He had graduated with an undergraduate degree in philosophy and worked for four years teaching children wilderness survival skills camps in South Korea, Prague and Italy. While working in the wilderness camps, a director sent Kesinger to an Emergency Medical Technician (EMT) program for training he could transfer to the children in the camps. A doctor in that program sparked a sudden and intense interest in science and medicine. To get a flavor for a life in medicine, Kesinger earned his EMT certification and rode in an ambulance for two years as he took the pre-requisite classes to enter medical school. He wasted no time in combining his previous passion for overseas work with medical research by conducting two studies of electronic medical records in Colombia. Discovering a nascent interest in data science, he then joined a study on pre-hospital stroke identification, which became the basis for Forest Devices. He also started thinking about how to translate his research discoveries into clinical therapies and entered the Benchtop to Bedside course offered through the Innovation Institute. As his entrepreneurial urge to advance his idea for improving stroke diagnosis in the field became insatiable, he requested and received a leave of absence from the medical school. “I am incredibly grateful for the flexibility that the School of Medicine has provide to allow me to get Forest Devices off the ground,” he said. Simultaneous with launching the concept for Forest Devices, Kesinger enrolled in Carnegie Mellon’s Heinz School to gain an understanding of healthcare policy. With his initiatives to learn medicine and the machinery of American health care in progress, Kesinger turned next to learning how to launch a company. His first step was competing in Pitt’s Randall Family Big Idea Competition. Open to all students across the University, from freshman to postdoc, the Big Idea competition offers $100,000 in prizes to encourage students to propose and develop an idea for a new product, service or social enterprise. The competition pairs student teams with experienced mentors to shape the idea and create a polished video and pitch to a panel of judges selected from local startup accelerators, economic development agencies, early stage investors, and nonprofits. Kesinger didn’t win a prize, but the experience he gained and connections he made in the competition was a baptism in the waters of the Pittsburgh’s entrepreneurship ecosystem. He flowed from Randall to the Ascender startup accelerator in East Liberty where he and his co-founders Dan Willis, chief technology officer, and Steve Morrow, chief business officer, continued to build the prototype for the device and develop a business plan. From there they entered the AlphaLab Gear accelerator in the same building as they added advisors to their team and prepared for the first study of the device in conjunction with UPMC and West Virginia University. The advisors include people like Larry Miller from Innovation Works, the state early-stage investment agency; David Motely, co-founder of BlueTree Venture Fund, which invests at later stages; Dottie Clower, chief scientific officer at Pitt biotech spinout Cohera Medical; Jim Jordan, CEO of the Pittsburgh Life Science Greenhouse; and Lawrence Wechsler, Pitt neurology professor and founding director of the Pittsburgh Medical Center Stroke Institute. They next entered the CMU McGinnis Venture Competition and won the top prize. 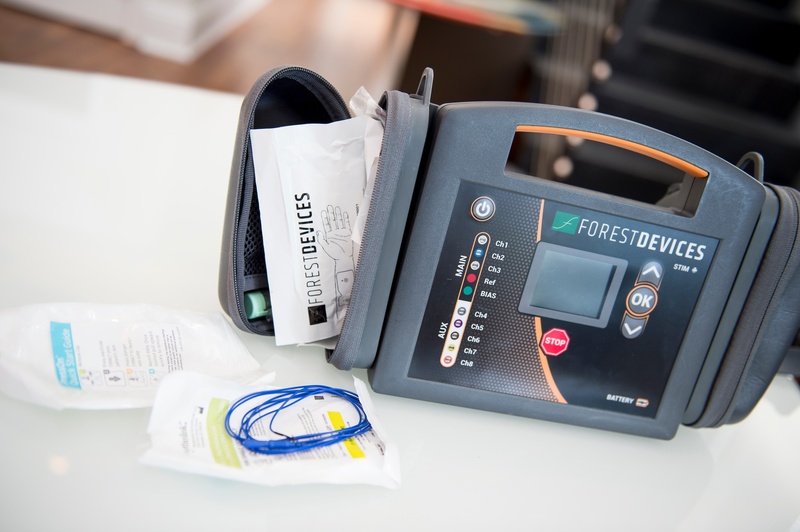 Forest Devices’ initial product, ALPHASTROKE works by confirming a stroke with electrodes on the head that can allow nursing homes, hospitals and emergency medical personnel to accurately detect a stroke so that the patient can be directed to the correct facility. In many instances of stroke, Kesinger said, people are taken to the hospital where they receive a CT scan. Most hospitals, particularly in rural areas, are not equipped to treat stroke patients, which means the patient must then be transported to a stroke center. The time lost in this process can have a serious impact on the patient’s clinical outcome. “Time is brain, but we don’t have a good way to detect stroke early. Only one in 7 hospitals can effectively treat strokes,” Kesinger said. Diagnosing stroke in the field can eliminate unnecessary CT scans and get the stroke patient the right care, faster, which is critical to stemming damage to the brain. Kesinger said Forest Devices is initially targeting hospital systems that operate their own ambulance services who would benefit from receiving the correct reimbursement. Close-up image of the Forest Devices prototype. Forest Devices’ director of clinical relations, Steve Norcup, like Kesinger, has previously worked on an ambulance, in his case as a paramedic. At Kesinger’s suggestion, he too is working on a master’s degree. He chose the new Executive MBA in Healthcare at Pitt’s Katz Graduate School of Business. In this program, he is working alongside clinicians and administrators from UPMC who are interested in advancing their leadership skills. Norcup is currently helping to build Forest Devices’ next study, which will examine how long it takes medical personnel to apply the device. The study is pivotal, as it will set the stage for the company’s application for FDA approval in 2018. Norcup recognizes that Forest Devices has drawn significant support from the regional ecosystem. Norcup feels obligated to give back, and has done so by mentoring teams in Pitt’s First Gear program, which helps Pitt faculty and students determine if their innovations have market potential. He was thrilled when a team he mentored won a prize in the 2017 Randall Family Big Idea competition. For Kesinger, getting the ALPHASTROKE device to market where it can save and improve lives will be the ultimate way to give back, so that when he finally does earn that M.D., he will already have made a difference.